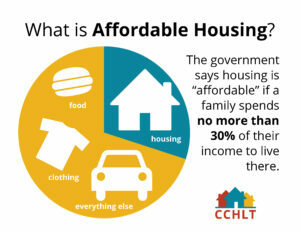 Home › What is Affordable Housing? According to the U.S. Department of Housing and Urban Development (HUD), affordable housing is housing that costs no more than 30% of your median family income. Do you live in housing that is affordable for you? 100% Area Median Income (AMI) in Centre County for 2016 is $73,600 for a family of four. Area Median Income is the amount which divides the income distribution into two equal groups, half having income above that amount and half having income below that amount. At Centre County Housing and Land Trust, our mission is to strengthen communities through the development and stewardship of permanently, affordable homes for people of low- to moderate-income. This means that we serve people from 60-120% of the Area Median Income. Each year, our income guidelines are adjusted by HUD. Typically in Centre County, these numbers have been increasing annually. Why do we serve Centre County? Read more.